The GOONCH – A GREAT Fish like no other !! A giant silhouette moves across the river bed. The creature effortlessly glides against the fast current, in a clear stretch of the river it reveals itself….Enormous appendages frame its face, marking it apart from any other fish – a Goonch !! Sounding like something from a Roald Dahl tale the Goonch is indeed an unusual and mysterious fish. A member of the catfish species it lives in some rivers in Northern India and Nepal, and other rivers of the Asian subcontinent where the conditions are right. There is still much we do not know about the Goonch in the wild. Their day to day behaviour, feeding patterns, reproduction, migration, life span, interaction with each other, and potential growth, to this day remain largely unknown and undocumented. 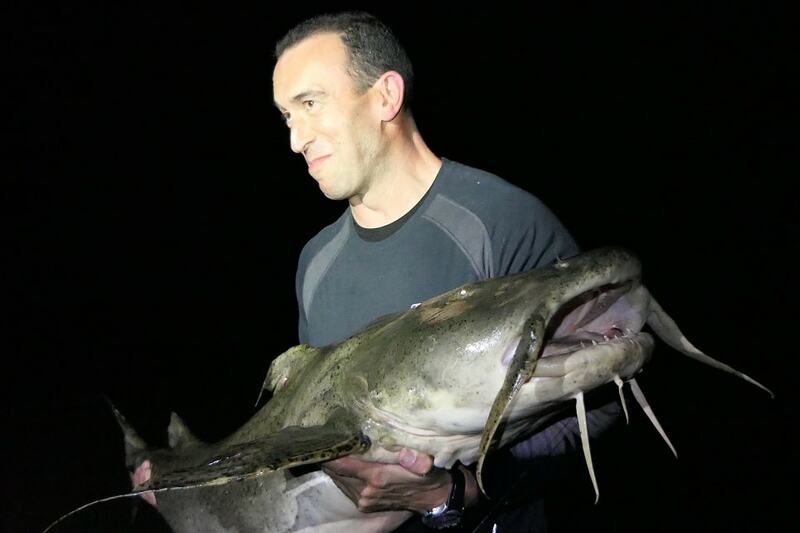 So little is known about the wild Goonch’s behaviour that perhaps the Anglers and Guides who have been lucky enough to observe, catch, and handle a wild Goonch Catfish have had the best insight, albeit a fleeting one. Unlike the Wels Catfish that is easier to locate (both geographically and in the river itself) the Goonch is at the other end of the spectrum. There are stories of accomplished anglers waiting weeks and months without so much as a bite from a Goonch, even in locations where Goonch are known to frequent. An Angler describing the perfect Goonch Swim will probably refer to; a submerged cliff face, huge rocks, under-cuts, underwater caves, or even the nearest National Park where fishing is prohibited. However, this is only part of the challenge in trying to catch a big Goonch. Even once you have located a Goonch it may not be interested in taking a bait. This scenario can go on for days and weeks on end. There are reliable accounts in clear water of a perfect bait presented in a perfect way being of no interest at all to the Goonch. One is left having to conclude that perhaps Goonch, even very big Goonch do not need to feed that often at all…. Next comes the challenge of how does the Angler on rod and line extract a very big and strong Goonch from its rocky home?? How Big? In terms of potential Goonch size, the current IGFA All-Tackle World Record is only 165lbs and 5 ounces (75kg). We say “only” because it is widely accepted that Goonch can grow much bigger than this. Visual sightings from Guides and Anglers which can be describe as “reliable”, suggest a weight of at least 300lbs. There is at least one photograph we have seen that would support this 300lbs weight estimate. Accounts from Anglers who have caught big Goonch would support claims of Goonch having impressive strength, “Like hooking into a Raging Bull ! !”, is a phrase we have heard. Their body and tail is very muscular, thick, and powerful and a swipe from the tail can do serious damage. Their mouth has many conical teeth that extend below the gum-line, and their bite is a clamping non-release one. Those who have held a big Goonch will also have had an indication of their strength. Goonch when held are considerably more dense, stocky, and muscular than Wels catfish for example. How Fast? You could be forgiven for thinking from their appearance that Goonch are slow swimmers. However, in reality Goonch are very fast swimmers, and you only have to hook one to find out just how very fast they are! Not only are Goonch sporadic eaters, very strong, and fast swimmers, but Goonch are also experts at “locking” their position on the river-bed once hooked. They do this by wedging their body, fins, and head against or under immovable rocks on the river-bed. Once a big Goonch is “locked down” in this way no amount of tugging with rod and line will move it. In these circumstances the angle of pull on the line has to be changed (however this still may not work), in which case the Goonch has to be physically disturbed from its position by dropping rocks in its vicinity, or by someone bravely swimming down with a facemask on to give the Goonch a poke….. Deeper Sonar has joined forces with “The GREATEST Fish” a fishing expedition company that specialises in tracking down, catching, and releasing Goonch Catfish.